Description: Running out of time, a radio control GP38-2 gets left with our outbounds. 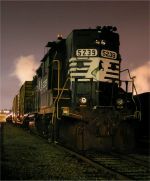 Description: A quartet of hi-hood GP38-2's on P61! Description: Never thought Id be happier about a high-hood. 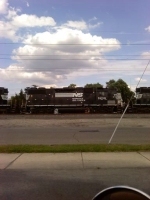 Description: Locos lined up in Harrington. Description: A look at NS 5239. Title: Get blown away by these bells.